George S. Kaufman was an American theatre director, producer, playwright, drama critic, and humourist. He was one of the most successful and popular American personalities the 20th century. He was not only a dignified personality but also an inspiration for others. His playrights and other works had a hidden message for others. It is because of this reason every piece of ‘creativity’ that Kaufman produced was highly influential. 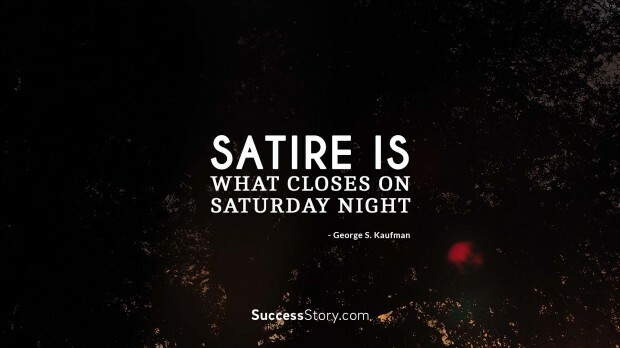 "Satire is what closes on Saturday night "
George S Kaufman biography showcases he was a highly qualified and professional individual. He had gathered immense name and fame in the industry for his great work. Kaufman co-wrote various musical and screenplays that are not only award winning pieces but also portray beautiful life messages. Kaufman had a painstaking approach to writing. He did not mesh with his team’s compulsive improvisation. He always looked forward to inspire and cheer up the people through various forms of his works. Kaufman had always proved himself a master of playright and humourist. He was adept particularly at satire and comedy. George S Kaufman works is the reflection of his great thinking and ideology. He has been inspiring people to achieve great heights. Even if we are born poor, we should work hard and harder to eliminate it from our lives. Kaufman left such an emphatic impression on the audience through his creativity and expertise. His quotes and sayings are highly inspirational. It will be a pleasure to know about this great personality through his speeches and sayings. It will be a thing of great honour even if we add even a little part of his character into ours.